Turbo Charging My Macbook Pro Again! The first upgrade I had for my Macbook Pro was to increase the ram to 8GB from 4GB when I got it in Sept 2011. This Macbook Pro has been serving me well and the performance has been reasonable. But all these while, I have been contemplating another upgrade, ie. upgrading the harddisk to an SSD. 2 reasons for wanting to do so. 1. Disk IO on normal HDD is really not optimal. Given all the new features in Lion for suspending to memory, resume to last desktop etc, using the normal hard disk really doesn’t cut it. Resume is slow, going to sleep is slow. 2. I want to eliminate movable parts in the machine. I find myself carrying my Macbook Pro around in office very often. Moving parts means a higher possibility of accidents during movement. 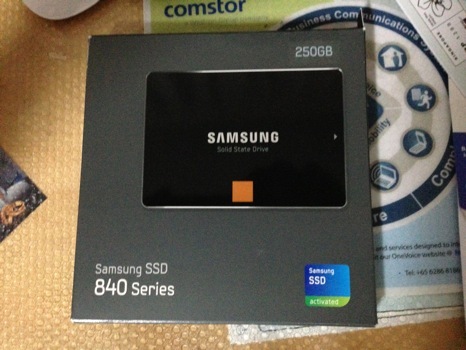 I didn’t do so until now, because the price of SSD has been really prohibitive. Not that it’s very cheap now, but I find that it vastly more justifiable with the new enhancements in the SSDs. I don’t have write about the upgrade process. You can find it on iFixit. In short I got it installed in less than 10 mins. Next is internet recovery and then restoring all my stuff from Time Machine. This is the personal experience now. 1. Booting of machine to login screen takes 8 secs. 2. Logging to having the full desktop, 5 secs. 3. Firing up applications, 5 – 10 secs, depending on the apps.